With the engineering skills gap in the UK still presenting a major challenge to companies that are facing great growth opportunities many are realising that to secure engineers with the right skills set for the future your only option is to grow your own! 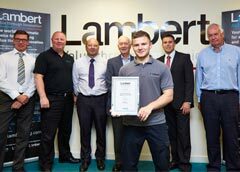 Lambert Engineering are just such a company – highly successful and looking to build a legacy for the future they have been actively involved in taking on apprentices for some time. In 2015 they announced their apprentice of the year competition, open to all of their apprentices regardless of what stage they were currently at within the program. Festo and Lambert Engineering share many of the same values across their business and we were proud to have been asked to aid in the judging of this competition and to sponsor the awards for the winner. Taking place on the 30th September the event was held in the Wainman Innovations Centre at Lambert Engineering and the award presented by Peter Wainman who started the company in 1973. Adam, who is in the 4th year of his apprenticeship, received a framed certificate and a plaque to be located in the centre. Festo also provided a Festool tool kit and placement on a training course of Adam’s choice. With many manufacturers now realising the value that apprentices can bring to their business, not just as individuals but as inspiration for existing employees, we hope that we can look forward to working with more of them in future.